Testing the effectiveness of new pharmaceuticals may get faster thanks to a new technique incorporating quantum dots developed at the University of Central Florida. Some drug testing can take a decade or more, but UCF associate professor Swadeshmukul Santra and his team have created an electronic quantum dots (Qdots) probe that “lights up” when a drug it is delivering attaches to cancer cells. The research appears online in this month’s Biomaterials. A researcher can use a microscope to see where and how much of the drug has been delivered because the probe emits a reddish color under special lighting or via MRI because of its optical and magnetic components. As the drug testing continues, images can be taken over and over without any loss of optical or MRI signal. Researchers can then measure the size of the tumor and number of cancer cells that “light up” compared with the original untreated tumor. This provides a way to determine whether the drug is doing what it is supposed to be doing in the targeted areas. The technique is much easier than the current process of removing treated cancer tumors and weighing them at regular intervals to determine the drug’s efficiency in an animal. 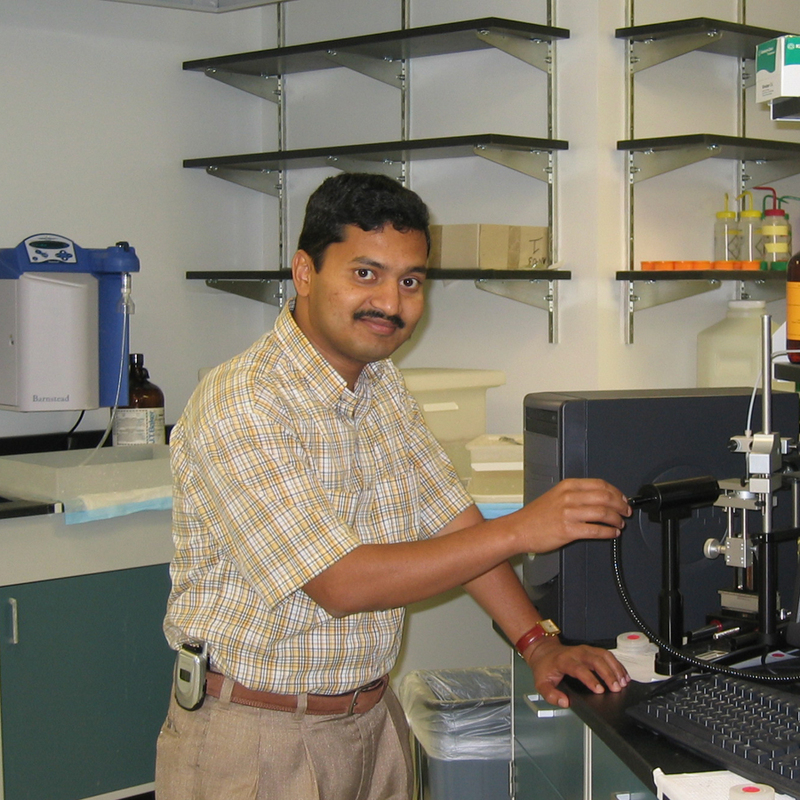 Sudiptal Seal, the director of UCF’s NanoScience Technology Center and nanoscience scientist believes Santra’s research is significant. Santra and his team used semiconductor Qdots to create the probe. Because of their small size and crystal-like structure, Qdots display unique optical and electronic properties when they get excited. These unique properties make them ideal for sustained and reliable imaging with special lights. For this research funded by the National Science Foundation and National Institutes of Health, the UCF-led team used a superparamagnetic iron oxide nanoparticle core decorated with satellite CdS:Mn/ZnS Qdots which carried the cancer-fighting agent STAT3 inhibitor. The Qdot optical signal turned on when the probe bonded with the cancer cells. “The potential applications for drug testing specifically for cancer research are immediate,” Santra said. Collaborators on the research included: Andre J. Gesquiere also of UCF, James Turkson of the University of Hawaii, Glenn A. Water of the University of Florida and Patrick T. Gunning from the University of Toronto. Santra has his own team of students and scientists at the UCF NanoScience Technology Center, which has been studying nanotechnology, quantum dots and their applications for years. The team focuses on the engineering of nanomaterials for bioimaging and sensing, drug delivery and anti-microbial applications. Santra joined UCF in 2005 after working as a research assistant professor at the University of Florida. He has a Ph.D. from the Indian Institute of Technology Kanpur and served as a postdoctoral fellow at the University of Florida. He has written dozens of articles and book chapters on nanoscience and nanotechnology. Santra also holds eight US patents in nano-bio and biomedical fields.